This has a pretty good design to it. I don't really understand how the mouse controls work. Wouldn't it be easier to just make spinning the mouse in a circle allow you to move in a circle, instead of having to drag it left and right over and over? I also instinctively tried MAME's insert-credit keys (5 for coin, 1 for 1P start) before reading the important note. I chose these mouse controls because they seemed like the most obvious thing at the time. 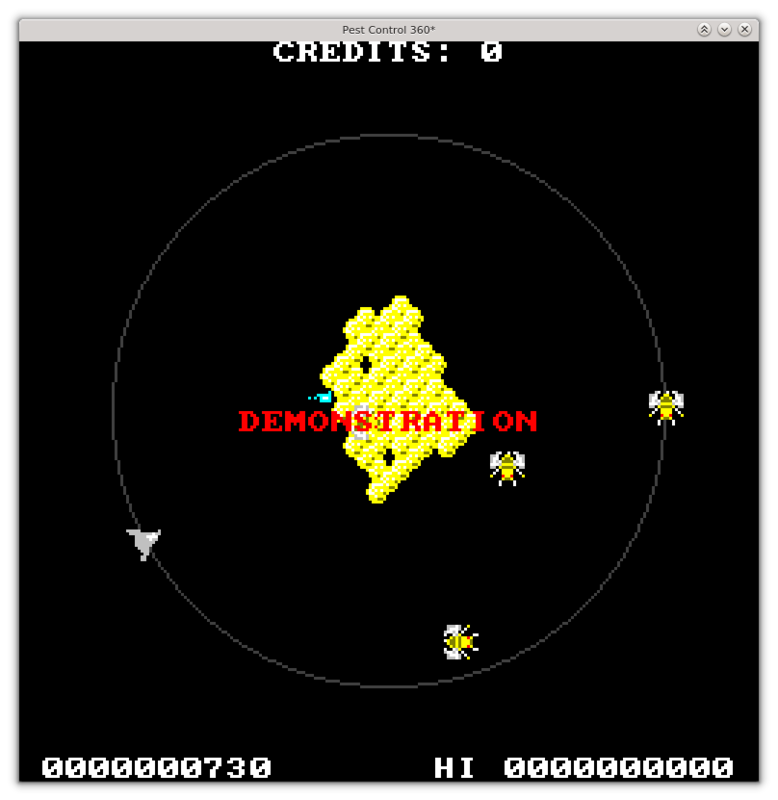 Besides, Tempest controls the same way (at least, in the Microsoft Arcade version). My main issue with the "point at the angle you want" control scheme is that your control sensitivity changes rapidly depending on how close your cursor is to the center of the screen. Plus, since the ship's movement speed is capped, it would also make control feel unresponsive. It would be lovely to play with a dial. I found myself wishing for some kind of visual reward for beating the hive back; a hint of the neon colors on the title screen? I really just want every game to end in a screen-clearing explosion that makes my brain say, "hey". I liked shooting the bees but it was hard if they ever got too far away from the hive. Risk reward, I know. Oh man, I wish I had a trackball for this. "Source code" release. Watch out for ugly unrolled loops since I didn't feel bothered to use Clickteam's version of for loops. All this in the world of klik n play... and what design, innovation, visuals, noises, this little item has it all.. as ascii jill of the jungle ad says: FAR BETTER THAN NINTENDO! Actually, this was made in MMF2, not KnP. KnP doesn't have trigonometry, arrays, sprite rotation, ability to set the framerate to 60 FPS, etc.